Yesterday we made a batch of these and some beautiful cheesecake brownies to sell at a bake sale at our school today. The sad thing is that all of the blondies and the brownies sold before we could even get one ourselves! So, after we took the PSATs today (who invented them anyway? Obviously whoever did was not a fun person or was just in a bad mood! ), we decided to whip up another pan of these for our family to enjoy. These bars are for those of you out there who like the fudgy texture of brownies but maybe aren’t in the mood for something so densely chocolate. These bars have a wonderful caramel/butter flavor that is enhanced with chopped pecans (pecans lend themselves so well to baked goods, because they have a buttery flavor that improves almost any dessert) and white chocolate. Of course, a few regular chocolate chips add some nice contrast. 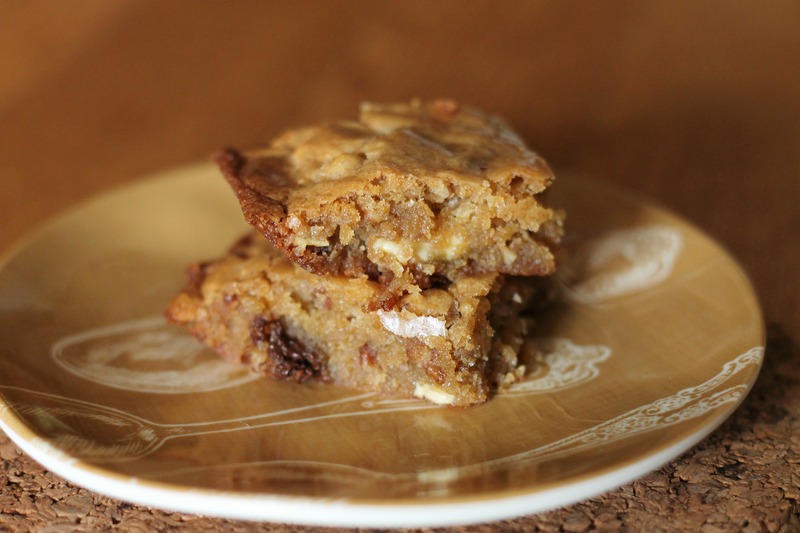 Blondies are not made by pressing chocolate chip cookie dough into a pan. They contain all brown sugar and often have other things mixed in- in this case, pecans and white chocolate. 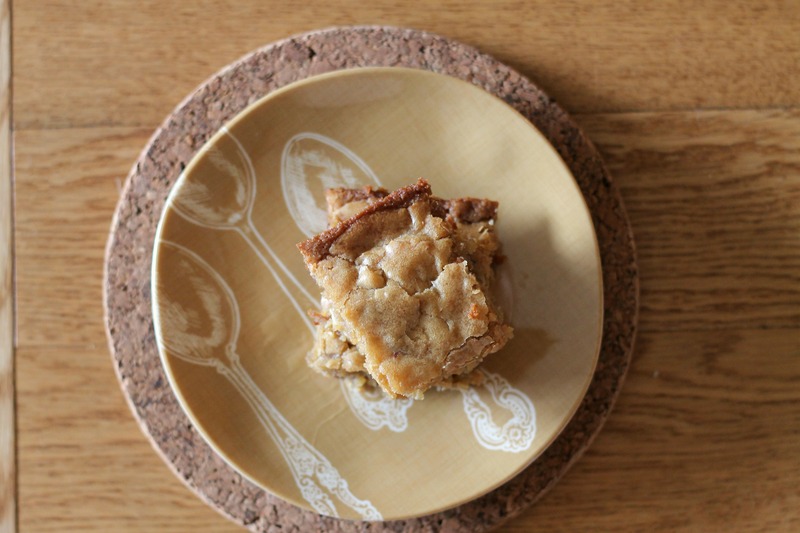 If you’ve never had an actual blondie (just cookie cake from the supermarket), you may be surprised about how delicious and buttery (and quick to make) these are! They are highly adaptable. 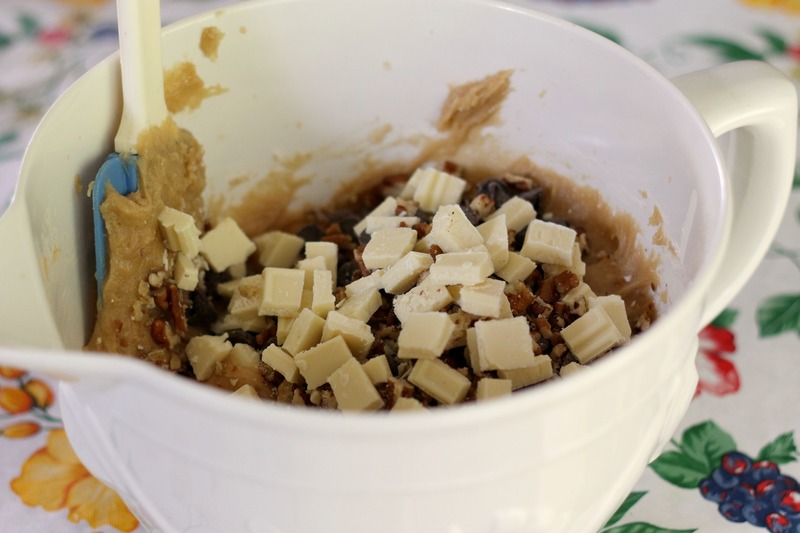 Some other tasty additions are butterscotch chips, chopped up Heath bars, or walnuts. It’s up to you! Adjust oven rack to middle position and heat oven to 350 degrees. Make foil sling by folding 2 sheets of aluminum foil so that are as wide as a 13 by 9-inch baking pan. Lay sheets of foil in pan with extra foil hanging over edges of pan. Push foil into corners and up sides of pan, smoothing foil flush to pan. Grease foil and set aside. Whisk brown sugar and melted butter together in medium bowl until combined. Add eggs and vanilla and mix well. Fold dry ingredients into egg mixture with a rubber spatula until just combined. Do not overmix. Fold in nuts and chocolates and turn batter into prepared pan, smoothing top with spatula. Bake until top is shiny and cracked and feels firm to touch, 22-25 minutes, or until golden brown. Transfer pan to wire rack and let cool completely. Loosen edges with paring knife and remove bars from pan using foil. Cut into 2 by 1.5 inch bars (to make 36). Enjoy! My boys, 16 and 14, took the PSAT’s today too! I will have to make them some your Blondies for all their hard work.